As pointed out on our home page, this Web site is organized into two major divisions: materials for Jewish inquirers who would like to investigate what Moses and the Prophets have to say about Ha Mashiach (the Messiah) and materials for Christians who wish to learn more about Jewish feasts and customs, biblical prophecy, and sharing the Gospel with Jewish friends. These two Web site divisions represent the twofold purpose of Ammi Ministry. Our first purpose is to bring the Gospel to Jewish people through culturally and historically relevant methods. 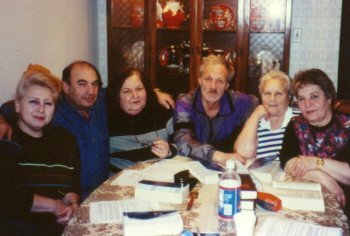 These include this Web site, Jewish holiday presentations, fellowship meetings, literature development and distribution, evangelism outreach (street witnessing, mail, telephone, and canvasing door-to-door), Bible studies, visitation, and the development of friendships. Since l984, AMMI has distributed over 1,000,000 Gospel tracts, held hundreds of outreach meetings, and visited hundreds of people to share the Gospel. Some Jews and many Gentiles have prayed to be saved. We then help these individuals through a discipleship ministry. Our second purpose is to minister to local churches in two ways. We seek to impart a vision to local churches and individual Christians for witnessing to their Jewish neighbors and friends. We teach seminars on Jewish evangelism and help local churches develop an outreach to their local Jewish community. Ammi is also directly assisting and working with a local church in Philadelphia to reach the Russian Jewish community. Over the years AMMI has taught at hundreds of churches and Christian schools throughout America. Many of our teachings and sermons focus on the Jewish feast days, which give a prophetic picture of the past, present, and future ministry of Messiah Jesus. These sermons and seminars instruct Christians in the Old Testament roots of their faith. The messages are evangelistic and have helped churches reach unbelievers. If your church would like to schedule Rev. Elkin to preach or teach, please contact Ammi's office.